Statin Drugs are mycotoxins that block the Mevalonate Pathway and kill you one-cell-at-a-time. Which cells go first depends on many factors. Rabbits die immediately. Dogs, mice and rats last longer. Some primates (the closest biological species to humans) that were given Statin Drugs had 100% mortality. People die at different rates. Some people acquire symptoms immediately — I did. Others have no apparent symptoms for years. All Statin Drugs kill. 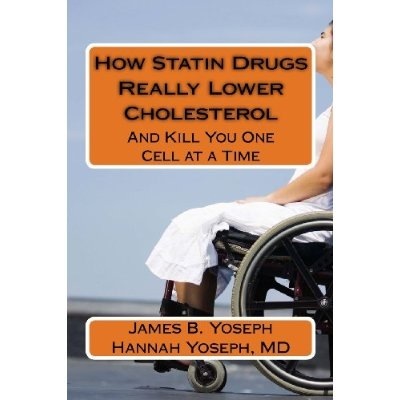 If you are taking a Statin Drug, it is killing you. If you want to optimize your health, forget about cholesterol and everything you have heard about it. Don't have your cholesterol tested. Don't take anything to reduce it. There is no relationship between serum cholesterol and cardiovascular disease. "None at all," according to Dr. Malcolm Kendrick. Lowering your serum cholesterol will not prevent heart attack, atherosclerosis, dementia or lengthen your life by one second. Statins will not save your life. Taking Statin Drugs kills you one-cell-at-a-time, for sure and without question. The only questions are how long it will take you to die and what the pathologist will say killed you. Statin Drugs block the Mevalonate Pathway inside your cells. Statins block 3-hydroxy-3-methyl-glutaryl-CoA reductase or HMG-CoA reductase for short. Because cells require cholesterol and isoprenoids to live and reductase — that allows them to be made — is blocked, the cell makes more reductase as well as extra cholesterol receptors on the outside of the cell to bring cholesterol into the cell from the blood. Serum cholesterol drops as a result. Your doctor is happy. But the cell gets no isoprenoids and DNA division and cell reproduction is arrested. Your body is not happy. Your cell dies and so do you. Every cell in your body is impaired by Statin Drugs, not only liver cells. Statins cross the blood-brain barrier to create dementia and polyneuropathy. Statins kill you and you get no benefit. Nothing. They don't even make you feel good. In fact they will probably make you feel lousy. Muscle pain and damage (myopathy and rhabdomyolysis) is very common, not rare as the pharmaceutical companies claim. So is polyneuropathy (my feet felt as if they were on fire and my hands were swollen frozen painful claws). This went on for years. Despite your little problems, your doctor will prescribe Statin "therapy" for "the rest of your life", however long that might be. Your doctor will also be prescribing lots of other pharmaceutical drugs to treat all the mysterious diseases you will be getting thanks to Statin Drugs. Statins are made from mycotoxins. Statins are mycotoxins. Mycotoxins kill by the same mechanism as snake venom and the Portuguese Man-o-War jelly fish. They will also lower your cholesterol. Would you eat Death Cap mushrooms? Probably not, but your doctor is feeding you Statin Drugs and you think he is saving your life. "All medicine is poison," one doctor breezily told me a few years ago. And now you know what he thought. Buy this book and educate yourself. Learn what your doctor should know, but doesn't. Look after yourself. Take a bite out of crime. Spread the word, Rick. Nice to hear from you! Are Body Building Supplements Necessary?